In my left hand is a weird thing that I found in my filing cabinet that I don’t remember what it is and it has a headphone jack and what looks like maybe a USB port but it might be some proprietary kind of port. In my right hand, is a– yeah, OK, play the music. 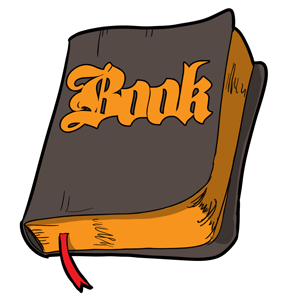 Welcome to the 30th official episode of BOOK, a bible podcast for everybody. My name is Josh Way. This is the podcast that examines the texts of the Judeo-Christian Bible in the context of both history and literature. The results are often surprising and perhaps even slightly interesting. This week we continue our look at the New Testament, a collection of Greek texts from the early Christian communities of the First Century, CE. Last time we concluded our look at the Gospel of Matthew, and this week we turn to Mark. The synoptic gospels (Matthew, Mark and Luke) have enough in common with one another that bible readers often assume they are interchangeable and shuffle their material together in an attempt to “harmonize” or unify them. Because of our specific interest in the literary style and context of each individual work in the canon, we’re looking at them separately and highlighting both harmony and diversity. Matthew wrote a very different gospel from Mark’s, and Luke brings a whole lot to the table that is unique to his text. We want to listen to the voices of these authors (and the Christian communities to which they belonged) as carefully as we can. We covered Matthew first because we’re going in canonical order and Matthew is the first book in your New Testament, but scholarship today considers Mark to be the first gospel written and the primary source from which Matthew and Luke adapted their versions. Mark is a short and brisk text, a fast-paced and action-oriented gospel, presenting a bold Jesus moving intentionally through a maze of dangers on his collision course with fate. 1 This is the beginning of the good news of Jesus the Messiah, the son of God. We’ve done a few podcasts on the Jesus material already, and we’ve said a lot about the word “Messiah,” but very little about the phrase “son of God.” Many modern readers tend to assume this to be a reference to the “virgin birth” and Jesus’ divine parentage. But it’s actually more far more nuanced than that. In the Hebrew Bible, everything from angels to kings to prophets and even Israel itself are described as YHWH’s “sons,” his close associates and representatives on earth. Meanwhile, the Roman religious cult referred to Caesar Augustus as the “son of the divine Julius.” In the ancient world, a “son of the divine” carried all of the authority and clout of a divine figure among their fellow humans. So while Luke does infer (in a single verse) a connection between Jesus’ miraculous birth and his status as “son of God,” Matthew does not make that connection, and Mark uses the phrase despite his gospel’s lack of a virgin birth. It’s best, as a starting point, anyway, to understand this phrase in the gospels as a reference to Jesus’ status as an authentic representative of Israel’s God, a prophet who carries an authoritative message. There had been other “sons of God” in Israel’s history, and there were many contenders within Israel and without, but the authors of these texts believe Jesus to be a unique and singular “Son of God” in the strongest sense possible. And where Matthew’s gospel gave us three long chapters of Jesus’ teachings about what “God’s Kingdom” looks like, Mark simply mentions that he “taught,” and then dives right into more action-oriented happenings, as Jesus calls his first disciples and begins healing the sick. All of this, and it’s still Chapter 1. Jesus chastises the “legal experts” and tells the paralyzed man to get up and walk home, which he does. Everyone is astonished, and the lawyers are enraged. (In this context “lawyers” are Torah experts, experts on Jewish religion.) They accuse Jesus of “blasphemy,” because he’s essentially bypassed the system of Temple sacrifice which was the only official avenue by which Jews could seek this kind of forgiveness. This man wasn’t even seeking forgiveness, he just wanted to walk again! But Jesus threw forgiveness of sins into the mix as a free bonus. This is symbolic of his whole “Kingdom of God” message, which says that God is pouring out good things in surprising ways and places. That kind of message always ruffles the feathers of the self-appointed religious gatekeepers. They claim to be offended by Jesus’ “blasphemy,” but they’re more likely ticked off about his undermining of their authority. The images of “unshrunk cloth” on an old cloak and “new wine” in old wineskins are ways of talking about Israel’s old religious customs and traditions and their incompatibility with the new things that God is trying to do according to Jesus. Now remember, Jesus isn’t a Christian critic of Judaism, he’s a Jewish prophet with a message for his own people, and prophets rarely come with a message that everything is going great and nothing needs to change. This idea would still be alarming and offensive in many religious contexts today, that laws and regulations are made to serve humans, not to rule over them. In Chapter 3 Jesus’ antics prove offensive enough to a group of Pharisees that they accuse him of being in league with “Beelzebul,” the “devil,” and they begin to plot with other groups to “destroy” Jesus. In Chapter 6 Jesus brings his posse to his hometown of Nazareth and starts teaching in the local synagogue, until his friends and neighbors tell him to get lost. A dejected Jesus delivers his famous line, “Prophets have honor everywhere but in their own country, their own family, and their own home.” A sad episode and, of course, a pointed microcosm of Jesus’ relationship with the whole nation. While taking a little “break” with his followers, Jesus is rushed by a huge crowd of people – five thousand, to be precise. He looks at them and sees “a flock without a shepherd.” Overcome with compassion, Jesus asks his disciples to bring some food. All they can find are five loaves of bread and two fish. Jesus proceeds to feed the entire crowd with these meager provisions until everyone is satisfied. This story is remarkable enough at face value, but the deep Jewish symbolism amplifies its meaning. The clamoring crowd, the “flock without a shepherd,” is a picture of the first Israelites, wandering in the desert without guidance or identity. As YHWH provided manna for his lost children through the leadership of Moses, so he does once again through a new prophet. This is a story of “New Exodus,” and in case we miss the clues, there’s one more as the disciples gather up exactly twelve baskets of leftovers (one for each tribe of Israel). After three more chapters of miracles, healings, and increasingly intense clashes with the religious authorities, Jesus confirms his Messiah-ship to his followers in secret and takes them up onto a mountain where he is transfigured, as in Matthew chapter 17, with the added detail that a baffled Peter suggests building some tents so Jesus can camp out with Moses and Elijah. There follow (in chapters 9 and 10) two stories about Jesus’ followers fighting among themselves about who will have more power when God’s Kingdom is established on earth. Jesus tells them. “If you want to be first, you must be last of all and servant of all.” (9:35) And when two disciples request to be seated at Jesus’ “right hand” (the most prominent place of power), he tells them “You don’t know what you’re asking for!” (10:38) “Anyone who wants to be great among you must become your servant.” (10:43) Meanwhile, a wealthy young man comes to Jesus and asks “What must I do to inherit the life of the age to come [that is, the kingdom]?” (10:17) He explains to Jesus that he has kept the Torah commandments all his life, but Jesus tells him to “Go, sell all of your possessions and give to the poor” (10:21), and the young man walks away very sad. In Chapter 11, Jesus takes his campaign to Jerusalem and climactic events are set in motion. Jesus rides into the city on a donkey, a humble and ironic portrait of true majesty over against the bluster of imperial pomp. The very next day, Jesus performs his symbolic action in the Temple, the same incident recorded in Matthew 21, but in a way that demonstrates Mark’s extraordinary storytelling. We observed in Matthew how the story of Jesus cursing a fruitless fig-tree was intentionally juxtaposed with his Temple Tantrum as a sort of interpretive illustration. The tree failed at its only job and so has the Temple. In Matthew, the two stories are side-by-side but self-contained. In Mark, Jesus curses the fig tree, then enters the Temple to clear out the money-changers, after which the disciples discover that the tree has now withered. The one story is wrapped around the other, a technique Mark employs throughout his gospel. As in Matthew, Jesus spends his time in Jerusalem telling a few kingdom parables and calling out the hypocrisy of the religious authorities. And in Chapter 13, Jesus delivers his final apocalyptic discourse about the “end,” a decisive and calamitous event that would take place “before this generation disappears.” History and scholarship suggest, as we discussed in our Matthew podcast, that the destruction of Jerusalem and the Temple by Rome in 70 A.D. fits the description pretty well. In chapter 14, the Judaean authorities cook up a plot with one of Jesus’ own followers, Judas, to bring him into custody. Meanwhile, at a party, a random woman anoints Jesus with an “extremely valuable ointment. This offends the other partygoers, who call it a waste of money, but Mark knows and we know and the woman knows that new kings must be anointed before they are crowned. After the “Last Supper,” a Passover dinner where Jesus interprets his impending death with more Exodus symbolism (see the Matthew podcast for a few more details), Jesus is arrested in a place called Gethsemane, interrogated by the high and chief priests, and sentenced to death for failing to deny the charges of “blasphemy” against him. Unable to enact a death sentence on their own authority, the priests deliver Jesus to the local Roman governor, a man named Pilate. Pilate gives the festival crowd a choice: we can release Jesus Ben-Yoseph, a non-violent prophet accused of blasphemy, or we can release Jesus Barabbas, a murderous revolutionary who participated in a recent uprising. The crowd unanimously calls for the release of Barabbas, the literary implication being that the Judean crowd has chosen the path of violent revolution rather than the “narrow way” of Jesus. Jesus is stripped, mocked, flogged, scourged, and crucified along with two criminals. A crown of thorns is placed on his head by Roman soldiers and a sign on his cross mockingly reads “King of the Jews.” At three o’clock in the afternoon Jesus shouts in Aramaic, “Eloi, Eloi, lema sabachthani,” “My God, My God, why have you forsaken me?,” the same Aramaic quote from Psalm 22 featured in Matthew. Then, Jesus dies, the nearby centurion declares him to be “God’s son,” and we’re told that the “Temple veil” is torn in two. The veil was a massively tall and thick curtain that separate the holy inner chamber of the Temple, where God was believed to dwell, from the outer courts. Only the High Priest could enter this area, and only on one very holy day every year, the Day of Atonement. The strange detail about the torn curtain has a shocking implication: at the moment of Jesus’ death, something has fundamentally changed about how God can be accessed, and by whom. This is something we didn’t touch on in our Matthew podcast that deserves some attention here. What was the “meaning” of Jesus’ death? What happened on that cross? In a sense, that’s a strange question. A prophet with a radical message offended both the Jewish authorities and the Roman overlords and was put to death. That’s the historical description of the death of Jesus. And yet, from the earliest days the church has assigned all manner of theological meaning to this event. Today the most prominent method of describing the theological meaning of Jesus’ death – what some call a “theory of atonement” – is something called “Penal Substitutionary Atonement,” which chooses to understand Jesus’ death as a substitutionary blood sacrifice to appease the wrath of God. So prominent is this theory today that most of the Christians who subscribe to it don’t consider it to be theoretical at all, but simply descriptive and factual. “Jesus died the death I deserved so that God’s anger would be legally satisfied and so I could go to heaven.” But is this really consistent with the portrayal of Jesus in the New Testament? We’ve already observed that Jesus’ message has little to do with “going to heaven when you die,” and while he does call for radical repentance from sinful ways of living and thinking, the God of Jesus’ teaching is a loving Father, not a wrath-filled executioner. And why would Jesus walk around “forgiving sins” willy nilly if he still had to die to pay for them? That word “ransom” is crucial. A ransom is not the same as a substitute. Substitution says “you stand legally condemned but this sacrifice will absorb the wrath and the penalty that you deserve.” Ransom, on the other hand, is a mechanism for liberating captives from the wrath of an oppressor. The Jesus of the synoptic gospels, at least, is a liberator who literally died for the sinful ways of his people and their oppressors which enslaved them spiritually and physically. This was a Messiah who absorbed sin and violence instead of perpetrating it. Atonement theory is a complicated and often labored topic, and frankly is too often a distraction from the more practical and urgent aspects of Jesus’ message and legacy. It also has a major fault that has always baffled me, namely its obsession with the cross, and its failure to value or even address Jesus’ resurrection, which you’d think would carry far more theological weight. Mark’s account of the burial and resurrection of Jesus is even shorter than Matthew’s, with three women coming to Jesus’ tomb to anoint him, only to discover the tomb open and Jesus missing. Note that the number of women is different from that in Matthew’s account, and also missing is the dramatic earthquake. As in Matthew, an angel appears and tells them that Jesus will meet the disciples in Galilee. The gospel ends abruptly in Chapter 16 Verse 8, with the women trembling in terror. The oddly specific and super-creepy “signs” of this ending, combined with the different writing style and its absence from those early and “reliable” manuscripts, has fueled a scholarly consensus that this material is not original to Mark and was in fact added much later. Even most conservative bible scholars and teachers today don’t consider Mark’s “deleted ending” to be legitimate scripture. Of course, that opens all kinds of interesting cans of worms regarding the texts of the New Testament and the bible in general. But that’s more than enough controversy for one podcast. This has been BOOK, a bible podcast for everybody, and I have been Josh Way. It is good to be back! If you enjoyed this podcast I encourage you to share it with your online friends and family. If you have any comments, questions or constructive feedback, email me at book@joshway.com. You can also leave a voicemail at 801-760-3013, and I’ll try to respond on the podcast. Read the BOOK blog and find lots more content at BOOK.JOSHWAY.COM. That’s it for me, Bible pals. I’ll catch you next time.